Friends, followers, family, fabric-lovers and other things starting with 'F'. It's give away time over at Julia Bobbin for all those lovers of silk and shiny. I am giving away to one lucky person two meters of one of the most beautiful fabrics I have ever let my Janome sink it’s teeth into. The fabric is 100% silk Peau de Soie, also commonly known as Duchess satin and it’s in a hard-to-find royal purple. I have been on the hunt for more of this fabric in other colours ever since I found it but can only find whites/baby pinks/baby blues. If anyone knows anywhere online that you can purchase this fabric in other colours, let me know! Have any of you used this fabric before? It’s incredible! It is so strong and has so much bounce in it that it looks like it’s pumped with air! Take a look at this picture of the fabric folded on its side. I made a dress out of it a while back using Burda 7494 and I got compliments on it every time I wore it. The colour is so rich and vibrant and shiny. What I love about the body of duchess satin is that even when I took the dress off, it sat up like there was still someone inside it, it’s incredible! (And admittedly, slightly creepy). I loved the fabric so much that I bought me another two metres of it and I’m looking forward to giving it away to a fellow reader who can delight in it as I did. Side effects: when you touch this fabric people have been known to lose their vocabulary and be reduced to only the sounds ‘ooo and ahhh’ for at least five minutes. All entrants will be put into a hat (well your names will be any way - it’s logistically impossible to fit actual people into the hat) and one lucky person will be announced the winner. One random winner will announced in a blog post on March 4th, 2012. Oh how delicious! Speaking of delicious, has any one seen the Give-Away over at Thinking in Shapes? Ummm ... it's a Mad Men dress! In fact two mad men dresses, one in an extra small and one in a medium. Lady Danburry has made them in honour of the Mad Men Challenge. True story! Check out Lady Danburry's blog to win one of the dresses. How you are you going with your Mad Men dress? Found your inspiration dress yet? Picked the fabric? I have been busily stalking following many of your blogs and there are some mouth-watering ideas popping up. I have recieved a few emails from readers to say that they are unable to leave a comment due to some blogger glitch. I'm convinced it has to do with gremlins. The fabric and the dress is beautiful. Please enter me in your contest. It seems to be the colour of the season! I have a friend getting married in this almost exact purple and your dress looks fabulous. Would love to be entered into the giveaway! NY Fashion Fabrics (online) have an AMAZING range of beautiful silks for quite reasonable prices. There is a huge range of colours - they even have silk faille *gasp* gosh-darn I want to make a coat-dress out of it. Except that 6 yards would cost me upwards of $250. Eep! Still cheaper than buying in a store though isn't it. I just want to jump through the computer screen onto a pile of that silk. TMI? I've admired that dress since you made it! I'd be thrilled to get such a gorgeous fabric to sew with! Thanks for the opportunity to win it! The Fabric and the dress is amazing! That color is my 22 yo daughter's favorite color; would love to make her a dress out of it. Just found your blog through Debi's My Happy Sewing Place. Looks like fun! Between your Mad Men challenge & being invited to a vintage tea party... I'm nearly ready to get out my sewing machine again! Ooo, I love that color! Beautiful dress and beautiful fabric! Count me in please :-). 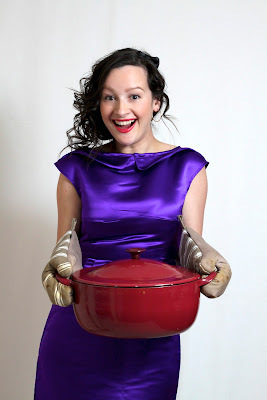 As for the Mad Men challenge, I know exactly what dress I want to make! I'll post details as soon as I find fabric. Purple's my favorite color and you've sold me on the loveliness of the silk. Hope I win! Are you serious? That is absolutely gorgeous! I would love love that fabric, would really come in handy for an upcoming wedding I am attending, a dress in that would be the bomb! Ooh that is gorgeous... What an amazing colour... where did you find it? Love what you've made with it too, very cute! OOOH, Purple, silk, swoon. You look terrific in your dress. I would love this fabric. Have you looked at Greenfields in Surrey Hills, Sydney? They have Duchess Silk satin in white, ivory and black on the website, but in real life I saw other colours (2010) and you can ring them up for samples. ooohhh! Fabulous giveaway! Count me in! This purple silk looks a-mazing! I would love to win it. Thanks for the awesome giveaway! I'm SO in on the Mad Men Challenge. I've got my Joan dress picked out, my pattern chosen, and my fabric all set - just need to actually get started! I cannot WAIT to see what everyone comes up with. So exciting! OMG. That fabric, that fabric, that fabric . . . Oh sorry about that I lost my senses. Yes please enter me for the contest. Ooo the mere thought of that fabric, that fabric. Oh here I go again. Toodles. Oh my gosh that fabric is definitely making my mouth water! Please enter me into the giveaway! That's one of my colors! I love love love royal blue-purple. And silk! I promise to make it into something absolutely incredible!! Oh wow, what amazing fabric! Beautiful fabric. I found your blog back when you posted about that dress. Would love to have that fabric. So pretty! That color is gorgeous! O.O i'm in love with that amazing fabric! That fabric is gorgeous! Would love to make something out of it! Pick ME ! Pick ME!! I want that fabric, yessm, I do. The fabric is gorgeous, and your dress is awesome! Thanks for such a generous giveaway. Oooh purple satin? Love! Thank you for wonderful giveaway! Oh yes please! I just want to say "peau de soie." It sounds so elegant. Beautiful purple satin! Yes, please enter me in the contest..
Wow! It's only a picture and I already want to touch it! Great giveaway! Oh - lovely fabric in such a dramatic color. I think this is the same fabric used in Kate's wedding dress. So beautiful. Both the dress and the fabric. Would love the chance to make something approaching that degree of loveliness. Oh, my heavens!! Such a gloriously decadent fabric! And the colour?? My favourite! I love royal purple so much even my HAIR is that colour! I would dearly love to win this and make something sensational - a two piece silk outfit, methinks! Lovely dress, but then, i suppose almost anything would look nice in such a pretty fabric! Oh man, purple is my absolute favorite color. I'm drooling! That fabric is gorgeous! And the dress is so pretty too. That is gorgeous fabric and you are very generous in sharing it with your readers. Thanks for thinking of us. This is beautiful fabric. I'd love the chance to win it. Thank you very much for the offer. Absolutely gorgeous! What a lovely giveaway! I'd love a chance to win it! Wow, so generous! Really beautiful fabric, gorgeous colour! I'd love to enter please. Your dress looks very elegant and chic. The fabric looks very luxurious. Count me in. Love your dress. Count me in for the giveaway. What a fabulous prize! That purple speaks to me. It could be because my mother used to dress me in purple throughout my toddler and kiddo years. I wonder if Purple Rain had anything to do with it? Anyhow, I'd love to be entered in your oh-so awesome giveaway. As always you're dress is amazing! Oh, such a delightful give- away! The dress you made out of it is completely stunning, I love the colour on you! Please enter me in to the give away! What a beautiful dress and fabric! Fabulous! And thank you for a very inspiring blog! I made my sister's wedding dress out of white silk peau de soie. Recently, I made her a wool coat and used the leftover bits from her gown as the lining. I dyed the pieces a nice tomato red and surprised her with a wonderfully soft and personal surprise. You've won me over - sounds fun to sew. And I look FABULOUS in purple! You have inspired me to have a go at burda 7494 and would be more than happy to use this fabric...thanks for the giveaway julia! It's fabulous! I would promise to give it a good home!! That's a fabulous fabric, and the dress as well. I found the dress I am going to make for the challenge, I am very excited to start sewing it. I even started a blog just so you could link the project back to it. Now, it's more time consuming than actually sewing the dress to post in it. But thanks for the motivation. Been following your sewing for awhile -- always a pleasure to see what you're scheming up! Love the color of the silk, would be honored to be the winner of your giveaway! What a beautiful fabric - thanks so much for the generous giveaway, please count me in. Can I just say I am still in awe over your gingham mad men number - gasped out loud when I saw it. Excellent work. What a lovely color! It would be a treat to sew something with this fabric! I haven't even touched anything like that in my life but I'm already oohing and aaahing over the color! WOW - the color is amazing and the dress is gorgeous. Thanks for the giveaway! Ohmigosh! I want to make the same dress you made! Beautiful fabric and knockout color! Tweeting about it too! Yes, please! That fabric looks lovely and it would be fun to win! Très jolie robe en soie! I'm all sorts of in awe of this fabric and this dress... I want it so bad. I love the dress you made from it! Purple is my favorite color and I have my fingers crossed tightly. Ms. Bobbin, you certainly know how to tempt a guy. Having discovered you on BurdaStyle, in all your irreverent splendor, it's delightful to see you have your own blog with a fitting following (more "F's"!). OMG I've never won a giveaway before but I REALLY hope I win this one, especially if what I make comes out as good as yours! Well, typically, fabric always looks better in real life than in pictures on the web, because there is so much more to it than the flat one dimensional image we see. But, my oh my, the photos make the silk look absolutely amazing! I can't even image how incredibly stunning, soft and luxurious is must actually be. I would love to win, but if I don't, I'll come back to this posting often to drool and dream! Thank you soooo much for the giveaway! Will you make me the dress too? Love it! 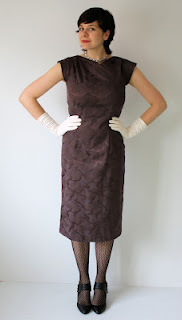 I have been studying Mad Men lately to find the perfect dress to make! Me, me, pick me! This is the most awesome colour! Can just see it made up now. you are awesome! dress is gorgeous! fabric is divine! amazingly generous giveaway! That's a beautiful silk! enter me please! 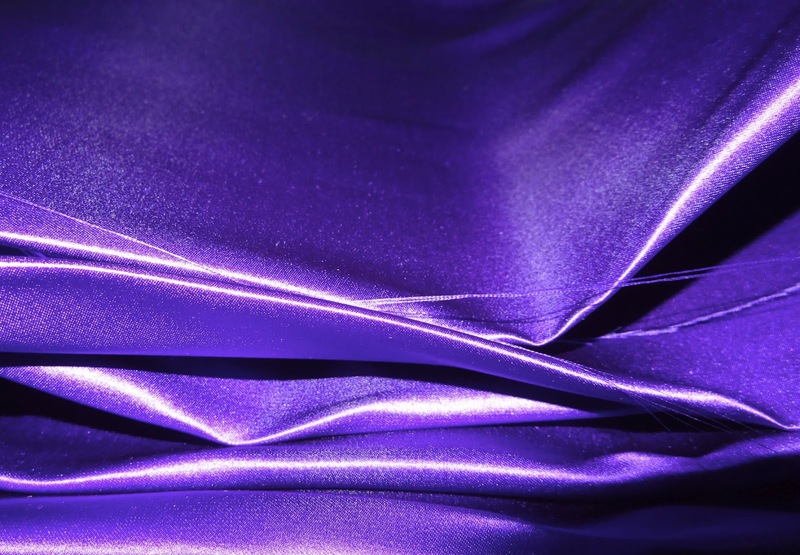 I can't believe you found that beautiful silk in a real, absolute, actual purple! Fantastic giveaway! Enter me please. Thanks for the giveaway! Gorgeous fabric Jules! You have the greatest taste in fabric and dresses! Oh my god! I can't say anything else, this fabric is amazing! 17 years ago my mum made my wedding dress out of Peau de Soie. Divine! You look gorgeous as usual! I follow you on BurdaStyle - please throw my name (Beth Hall) in your hat!! Did you also use this fabric for the Vogue 1190 dress you made? Both dresses are gorgeous. I would love love love to win this beautiful silk!!!! Such a gorgeous fabric! I love silk. soft and shiny! and purple.... irresistable! i melted so quickly when i saw that fabric you probably COULD put me into a hat. What a generous giveaway! Have never entered a giveaway before, but I was so tempted by this gorgeous fabric I couldn't resist. Like others I have been in love with that fabric and your creation since you posted. Oooh beautiful fabric! 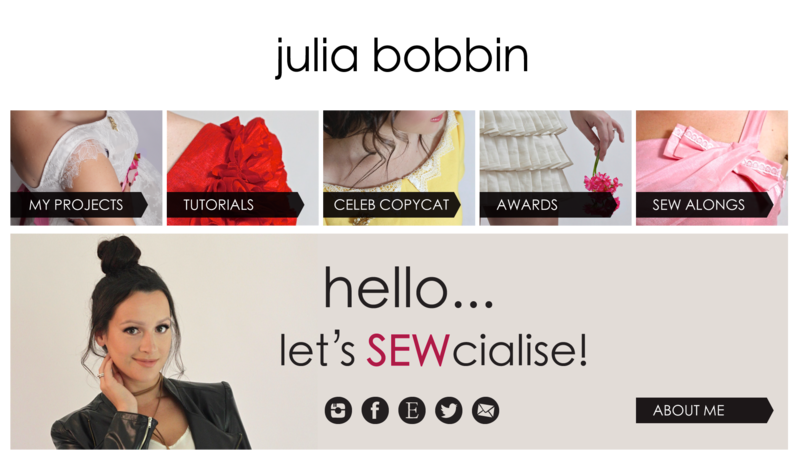 I think your blog is great - amazing photos and i always feel inspired to sew after looking at the things you make! OH. MY. GOD. THANK YOU FOR THIS GIVEAWAY. You have to stop being so amazing, it's awkward for the rest of us. I have my pattern and fabric picked out for my Mad Men dress, I think. Well, the pattern, yes, the fabric, maybe. I'm considering a mash-up on a Joan dress and a Faye dress. Which is of course the complete opposite of what I said I would do. Yeah. Go Figure. Oh wow, that is such a lovely fabric. I would love to have it. Oh this fabric is amazing! These are lovely colors that you have shown on your dresses! And of course I want this silk! I am drooling at my computer! that silk is stunning! and the colour is my favourite - ever! I don't think i've seen a purple so vibrant! It woul;d be perfect to make a dress to wear to my friends wedding later this year. Please put me in the giveaway. Beautiful fabric! That color is amazing! the fabric and your dress are beautiful!! Love the dress you made and the fabric. Wow, thank you so much! 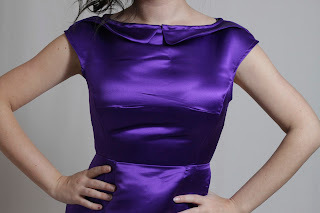 I've always wanted to sew with duchess satin and I love the colour purple. I've never sewn up duchess satin before.. but I think it might be time. What a rich color! Julia! This is so sweet! I would love to win the fabric! Oh, I also perused my patterns last night, and I've decided - I'm 100% IN on the Mad Men Challenge! What lovely fabric - thanks for having such a great giveaway. Wow - that fabric is TRULY delightful! I would love to get my hands on that - I have some formal dresses to make. It would be perfect for a little cocktail number!! WOW! Purple silk. Anyone who could go past this giveaway post without commenting is either bonkers or clearly not a sewer/seamstress. Please count me in. Gorgeous fabric! Yes, yes, yes! I can just envision a dress made with it:) Thanks for this awesome giveaway. This fabric looks wonderful! As does your dress made from it. What gorgeous fabric, I would love to enter! Thanks Julia, you're so generous! What amazing fabric! And BTW, fabric like this comes in a lot of colors, they're just labelled as "designer curtain fabric"... I once got 10 m dusty blue silk duchesse satin for 1,50 USD/m for a Sleeping Beauty-inspired evening gown. What a fantastic giveaway. I want to win. I love shiny silky fabric. The fabric is stunning! The dress looks beautiful on you. Yummy, I would love to have sheets made in this fabric!!! Oh that's so generous. The fabric is gorgeous, and your dress looks amazing. Yes please! I just discovered your blog, please count me in! I love that purple colour! Oh, gosh what a giveaway! I was just passing by your blog (via Lucky Lucille) and am really inspired by you. Thankyou very much for your generous offer - I would love to partake in it. Wow! That dress is really spectacular, please .... I also want I would be grateful to enter the giveaway too. 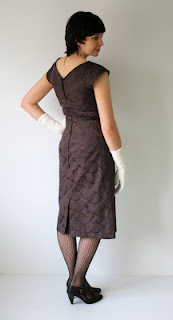 I sew a Mad Men dress too, here..
Beautiful dress! I've got Mad Men dresses on the brain as well. I have been wanting to make a purple top for a long time. My only fear is that if I won I would be to afraid to cut into this beautiful fabric. Just getting into your blog and loving it! Silk and purple, what a combo! And so beautiful!! Really? I can enter from Canada? I'd use this to make a dress to cheer up my mom (second divorce) and inject a little "mojo" into her life. Yes, wow what a love of comments. The colour of this dress is breathe takingly stunning!! Wow. I love it. Ahhh. Purple. A symbol of royalty! I don't know if its still open because I don't know what time it is in Australia but I sure love that fabric! Love the dress! the fabric is beautiful!